Fantastic and unbelievable! 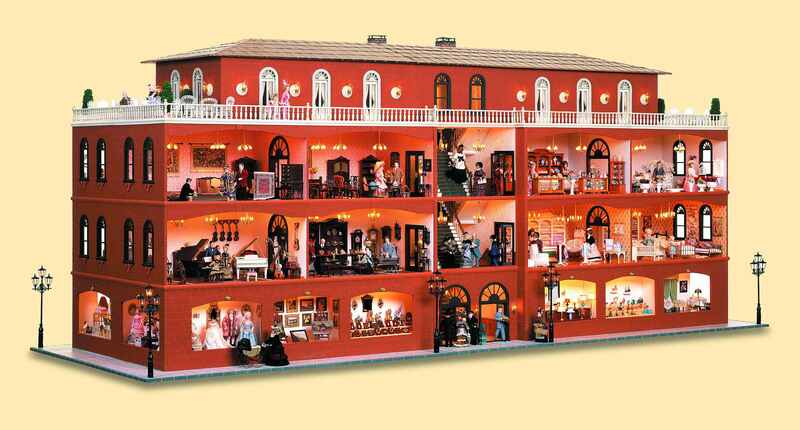 With a length of 3.30 m and a width of 1.20 m, the beautiful miniature department store offers a view of 16 shop windows and 17 lovingly designed sales departments. Who do we have to thank for this work of art? Brigitte and Klaus Reiser, the founders of MINI MUNDUS, who have managed to create an incomparable life's work, a living fascination! This miraculous achievement is furnished with the most beautiful stylish building sets and a countless number of valuable accessories, collected over many years. And all that with admirable creativity and an eye for detail! Take the time to accompany us on an impressive shopping spree through times long past and various stylistic epochs. Click here for the picture galery. We are convinced that you will find many ideas for your own hobby and hope you have fun in the big little world! Construction components and lamps from Mini Mundus were used in the construction of the department store. Most of the furniture was manufactured from Mini Mundus construction kits. Over 480 light bulbs were installed to illuminate the rooms. More than 120 porcelain dolls with hand-sewn clothing add life to the scenery. Exquisite miniatures faithfully reproduced from artists all over Europe were compiled over many years for the individual sections. The choice glass products were master-crafted in the glass-blowing town of Lauscha in Thuringia, Germany. The hand-painted porcelain hails mainly from the atelier of a German porcelain painter, and knickknack lovers will even find miniature bumblebee figures in one of the shop windows. The fine silver work was prepared by an English goldsmith.